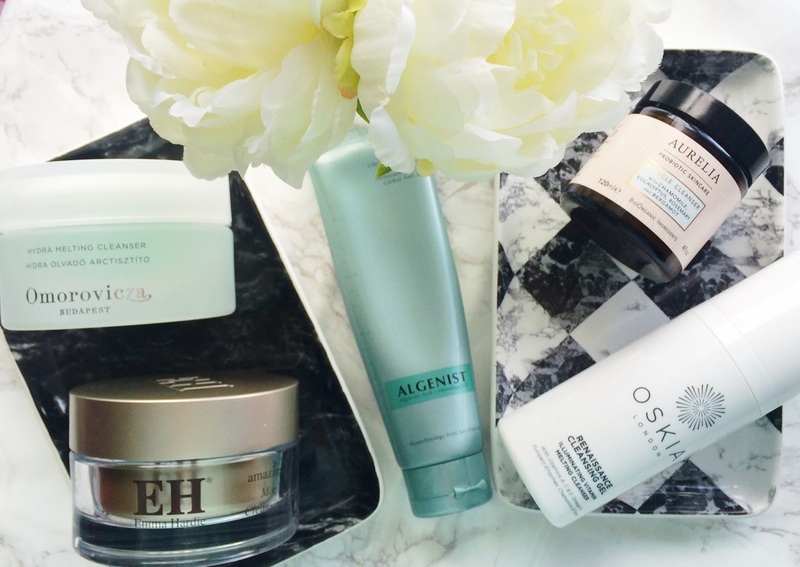 Five cleansers for dry skin featuring Omorovicza, Aurelia, Oskia & more! I have a bit of a thing for cleansers - there is just nothing nicer than taking your makeup off at the end of the day (slight exaggeration, but it's something I really enjoy doing!). I love taking the time to massage products in and making sure my skin is thoroughly clean and ready for the next step. I like cleansers that will cleanse thoroughly without stripping my skin because my skin is dry enough without using products that will aggravate it further. Today I am sharing five cleansers that from my current skincare collection that I reach for most often. There are some other cleansers that I have previously used and love, but just don't currently own, that I would also recommend for the dry skinned ladies out there - Omorovicza Thermal Cleansing Balm and Elemis Pro-Collagen Cleansing Balm. These cleansers will also suit other skin types too, but in my experience, they work really well for dry skin. Emma Hardie Amazing Face Moringa Cleansing Balm: This was one of the first cleansing balms I tried around four years ago and I fell in love immediately and could understand why it was such a hyped up product. It is quite an oily balm (as opposed to some balms, which are quite solid) and only a pea-sized amount is required because it spreads across the face quite evenly and easily. I like to take my time massaging this in and I then add some warm water to emulsify before removing with the double sided cloth that accompanies it. My skin is left thoroughly cleansed, very comfortable and soft. I absolutely adore this cleanser, having repurchased several times and I know that I will repurchase regularly in the future too. Anybody with dry, sensitive or stressed skin will love this. Omorovicza Hydramelting Cleanser: This is my most recent cleanser addition. I absolutely adore their Thermal Cleansing Balm (review here) - it is probably in my top 3 favourite cleansers of all time because it is so gentle on the skin, but I was curious about this hydramelting cleanser since its release. It is expensive, but I waited for a 20% discount code which softened the blow a little. As with every other products I have tried from Omorovicza, this cleanser is extremely gentle and hydrating. It is a soft gel formula but it changes to an oil when massaged into the skin and the oils (buckthorn berry oil and evening primrose oil) make the skin feel really soft, nourished and plump. When water is added, it transforms in to a milk, which is then rinsed. The result is very soft, hydrated, comfortable and fresh looking skin. A little goes a long way with this product so I am hoping that this 100ml tub will last a long time. Algenist Genius Ultimate Anti-Aging Melting Cleanser: This cleanser is quite similar to the Omorovicza in texture - it is a gel that turns to oil and then milk when water is added. It contains Alguronic Acid and Milcroalgae Oil, both of which are anti-aging ingredients (hence the name!) and the result is very soft, plump skin. It isn't quite as hydrating as the Omorovicza cleanser but if you like the sound of the Omorovicza cleanser but don't want to pay the premium price, then I would highly recommend that you try this cleanser as long as your skin isn't extremely parched. Aurelia Probiotic Miracle Cleanser: This is different from the other cleansers mentioned here today, in so far as it is a cream rather than a balm or gel. I adore the uplifting scent of this cleanser - it contains chamomile, eucalyptus, rosemary and bergamot, which makes it perfect for a morning cleanse. This cleanser would be suited to all skin types because it is extremely healing - when I first began using it, I had been suffering from a lot of breakouts along my jawline but this cleanser soothed and healed my skin. When I use this, my skin looks extremely clear, refined and radiant. This is my second jar of this cleanser and I know I will repurchase in the future. Oskia Renaissance Cleansing Gel: This is another product that I love for a morning cleanse, but it works really well at breaking down makeup in the evening too. It is another gel to oil formula and it is slightly stiffer in texture initially than the Omorovicza and Algenist cleansers, but it breaks down beautifully to an oil. This cleanser instantly makes my skin look a lot brighter (due to the exfoliating properties of fruit enzymes), plump and glowing and feel very soft. My only problem with this cleanser is that it is impossible to know when it is running low until it has run out - I would love if it had a clear panel on the side like the Algenist tube does. Have you tried any of these cleansers? I'd love to hear your thoughts on them? I'd also love to hear what your favourite cleansers are? Do you like balms/gels or do you prefer cleansing milks or foams? Please tell me in the comments below!